Welcome to Mike Vaughn Handmade Boots! Let us be your guide to the finest handmade boots in Texas. All handmade boots are not the same. We invite you to experience the Mike Vaughn difference. You’ll find quality in every pair made by a real, Texas master boot maker. You’ll want to visit the About page and get to know Mike Vaughn. You’ll want to be sure to browse through the boot gallery. Mike’s boots are as unique and special as the people who wear them. He makes a truly custom, great fitting boot for each individual customer. You’ll also want to check out the events page to find out when Mike will be at an event near you. And finally, you’ll want to contact Mike by phone at 940-872-6935 or email at mike@mikevaughnhandmadeboots.com to ask questions and to schedule an appointment to be measured for your very own pair of Mike Vaughn Handmade Boots. 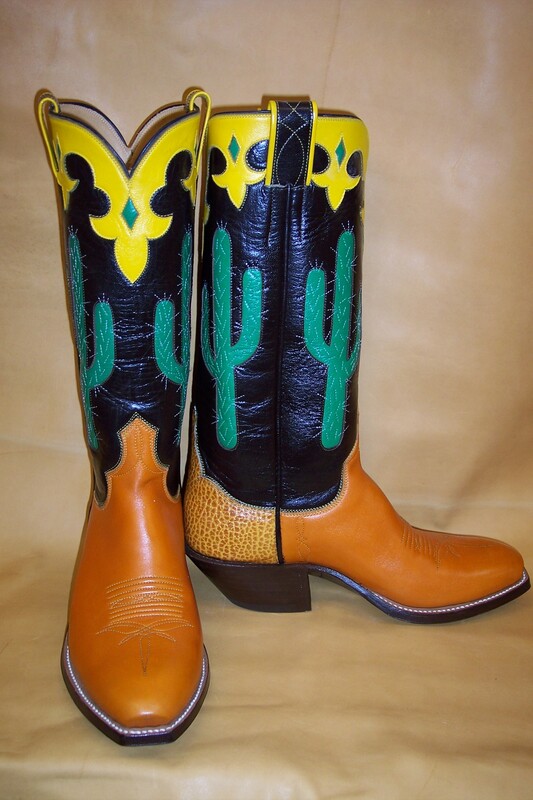 So grab yourself a glass of sweet tea, take your time and enjoy your tour of Mike Vaughn Handmade Boots. Thanks for stopping by! I first met Mike in Ft. Worth during the Futurity. I was glancing through his book of photos and really taking note of the detailed stitching on some of his boots. By the end of the show, I was sitting in his chair being fitted for my first pair of handmade boots. I was a little nervous as to what to expect, but Mike was very helpful in my choice of materials along with colors and style for my boots. Then he went to work. For a while I thought that maybe he had forgotten about me, until the phone rang one afternoon telling me my boots were ready. I recieved them in the mail and when I put those boots on, it was like pulling a sock on, the fit was incredible.!! I wore them all day that day, I just couldn’t believe how comfortable they were. Two years later to this day, I wear those boots everyday, and not a day goes by without me telling myself…I LOVE MY BOOTS. Mike Vaughn Thank You. I know who I will call in the future about getting some boots. I have 3 pairs of Mike’s boots and the quality is unsurpassed! Mike Vaughn also does some daywork cowboying so he knows first hand how a boot needs to be made for a working cowboy. I especially love the fact that he’s honest and truthful about your boots; how you wear them and what materials you need. I myself am very hard on the tops because of the way I wear my boots and how I ride my horse. At my 1st resole he told me I had to have my next boots out of tougher material. This meant a lot to me because I love getting my money’s worth. I would recommend Mike’s boots for anyone wanting the most plain jane work boot to the fanciest pair exotic skins you could imagine. You won’t be sorry!